70th Indian Independence day was celebrated by our team members with great patriotic fervor and enthusiasm. The whole office was decorated with lots of tricolor balloons & flags which evoked the patriotic feeling in all of us. Everyone was completely charged and in full swing. The theme for the day was Indian ethnic wear and team members arranged themselves wearing tri-color attire. Employees represented themselves in every possible manner which showed their love for the country. It was real fun seeing the amount of participation and enthusiasm in office. All in all, it was a memorable day that provided us a wonderful way to bond with each other. Thank you to the management and employees who made the celebration possible. Few Glimpses Of Independence Day Celebration In Our Office. This entry was posted in Events and Celebrations and tagged celebrations in india, celebrations in IT companies, Corporate Celebration in Noida, corporate celebrations, festivals in india, Festive celebration in it companies, SynapseIndia Celebrations on August 16, 2016 by SynapseIndia Careers And Jobs. 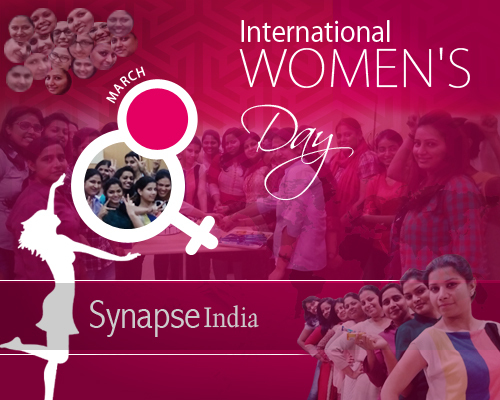 This entry was posted in Events and Celebrations and tagged corporate events in Noida, employee engagement activities, Games in IT companies, Synapseindia, Synapseindia events, synapseindia festivals, women's day celebration in corporate office on March 8, 2016 by SynapseIndia Careers And Jobs.